This contemporary style dining table set with a bench is sophisticated enough for guests or daily use with your family. The table's four tapered legs complement the contemporary look of the set. The rectangular table extends from 48 inches in length to 66 inches long with 18-inch leaf. The versatile leaf adds flexibility for hosting friends and family. Let this great table become the center of your home's dining and entertaining area. The four dining side chairs with a leather-look or gray fabric upholstered seats add contemporary style and comfort. The smooth, ladder back style backrests complete the sleek look of the chair. The modern bench adds great seating to complement the rectangular dining table and chairs. The tufted upholstery seat with the look of leather or gray fabric adds chic sophistication to the contemporary-style bench. 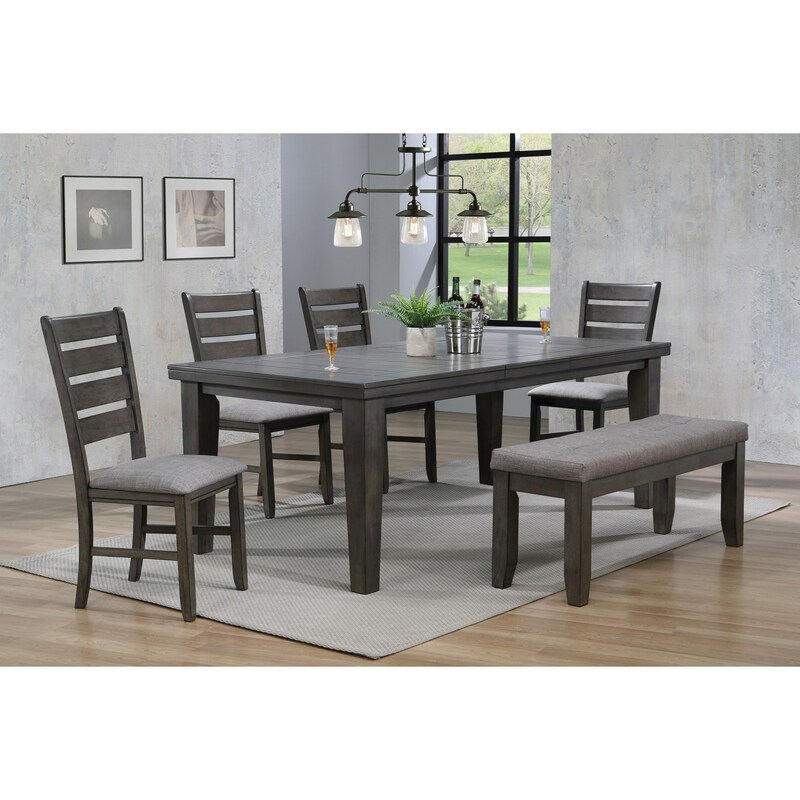 The Bardstown 6 Piece Dining Set w/ 4 Chairs & Bench by Rooms Collection One at Rooms Furniture in the Houston, Sugar Land, Katy, Missouri City, Texas area. Product availability may vary. Contact us for the most current availability on this product. The Bardstown collection is a great option if you are looking for Rustic Casual furniture in the Houston, Sugar Land, Katy, Missouri City, Texas area. Browse other items in the Bardstown collection from Rooms Furniture in the Houston, Sugar Land, Katy, Missouri City, Texas area.